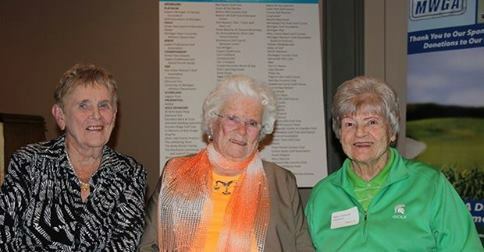 Meijer LPGA Classic presented by Kraft sparkles in Grand Rapids. As I wrote following the tournament in August: “For a debut tournament, it couldn’t have gone much better for the event held at the fan- and player-friendly Blythefield Country Club…especially with the affordable $15 any day ticket and with kids being admitted free with an adult.” A stellar field laden with majors winners highlighted the week which ended in an exciting playoff win for rookie Mirim Lee over Inbee Park. Colin Montgomerie wins his first “major” in SW Michigan. Monty shot a final round 6-under 65 for a four-stroke victory over Tom Watson at the Senior PGA Championship presented by KitchenAid at Harbor Shores GC in Benton Harbor. Equally impressive is the continued development of Harbor Shores itself, now a world-class 530-acre residential, golf and recreational community sending positive ripples across the area. Brian Stuard’s outstanding play on the PGA Tour. Earning over $1.8 million, Jackson native Stuard’s year was highlighted by a solo second finish at the OHL Classic at Mayakoba and playing in three of the four FedExCup Playoffs events before finishing 51st in the final FedExCup standings. 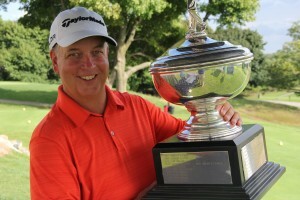 Scott Hebert’s 14th “major.” Pro at Grand Traverse Resort & Spa, Hebert fires a 61 in one round, tying the modern tournament and course record, en route to his seventh Michigan PGA Championship at Oakland U’s Sharf and Katke courses. It was Hebert’s 14th “major” pro title in Michigan, one off the record of 15 major titles shared by Michigan Golf Hall of Fame members Al Watrous and J.R. Roth. Symetra Tour stops in June at Battle Creek and Harris, Michigan. A feeder Tour to the LPGA, Symetra nicely lifted the state’s golf calendar with the $100K FireKeepers Casino Hotel event won by Min Seo Kwak at Battle Creek CC and the $125K Island Resort event at Sweetgrass won by Molly Aronsson. And next year over the 4th of July weekend, the Tullymore Classic debuts at Tullymore Golf Resort in Canadian Lakes. Michigan’s Laura Keuny will be in the field. Matt Harmon wins on PGA Tour Canada Tour and later earns a Tour card. A former Michigan State University standout and now Grand Haven resident, Harmon was one of only five players earning a coveted Web.com Tour card via the new PGA Canada Tour gateway. Henry Do wins the Michigan Amateur and his “wow” shot. With a spectacular birdie on the 18th hole while being one down in his match against Troy’s Steve Andersen, Canton’s Do goes on to win the Amateur title on the 19th hole at storied Belvedere CC in Charlevoix. Many observers and long time GAM officials said Do’s soaring 180-yard 7-iron shot to within a foot on the 18th hole was the best shot ever seen under the circumstances at the Amateur. Ferris State University and the Michigan Golf Hall of Fame. As part of the 2014 MGHOF’s induction ceremony in June, FSU officially welcomed the Hall of Fame to campus and showed blueprints and renderings of a facility to house its new Learning Center as well as the new home of the MGHOF. 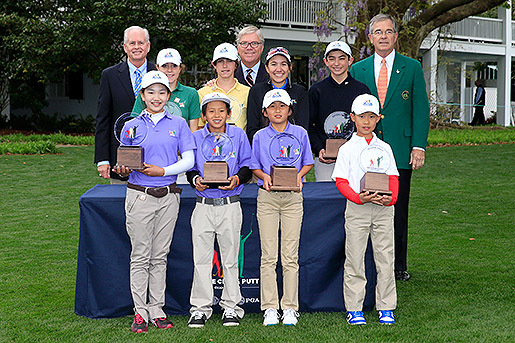 Four Michigan youngsters earn a spot in the National Drive, Chip and Putt Finals at the start of “Masters Week” on Sunday, April 5, 2015 at Augusta National Golf Club. Drum roll, please, for: Anika Dy, Traverse City (Girls, 12-13); Jordan Jurmu, Marquette (Boys, 12-13); PJ Maybank, Cheboygan (Boys, 7-9); and Coalter Smith, Grosse Pointe Farms (Boys, 14-15).